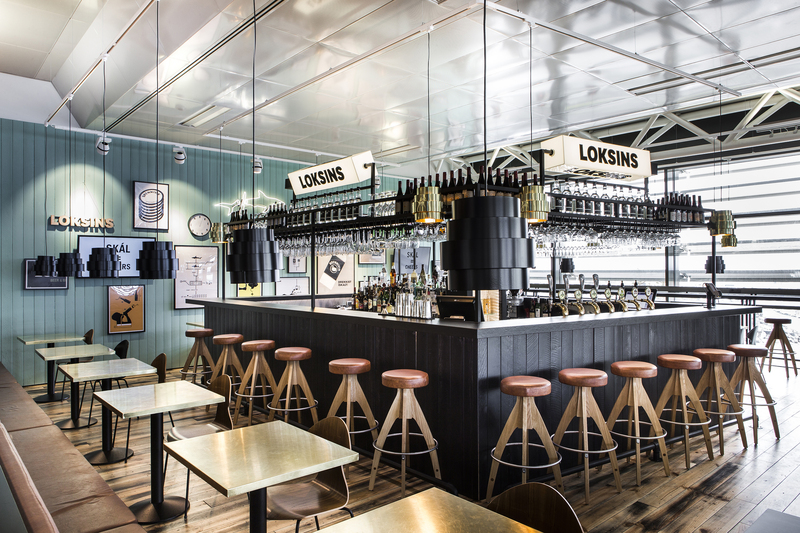 Loksins is the newest bar at the Keflavik International Airport in Iceland. It has Iceland’s largest range of beers from Borg Brewery, and is a frequent stop for travelers who pass through this busy airport. karlssonwilker developed the identity, including the naming. Loksins ended up being the final choice, translating from Icelandic as “Finally.” According to Hjalti, the client, and various other Icelanders, it is a beautiful Icelandic word, not often used, and one that fits very well for this bar and location. Ha! The four-sided rotating sign, with LOKSINS thrice and BRENNIVIN & BEER once. Loksins won a FAB 2016 award, and was named one of the best beer bars by Travel and Leisure. Our team designed four-sided turning signs above the bar, repeating Loksins thrice, before a “Beer & Brennivin” panel appears. A variety of wall pieces that speak to Iceland’s culture were installed on the back wall including the proper way of consuming Icelandic libations, the process of fermenting shark, neon signage, various animations, and a manual daylight calendar. A second Loksins location was opened shortly thereafter. In addition to posters, signage, and menus, we designed clocks and a neon shark. Above is a manual "calendar" showing the amount of daylight for each week of an Icelandic year.